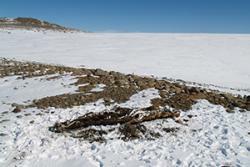 Mummified southern elephant seal remains from the Victoria Land Coast, Antarctica. : image credit Brenda HallGenetic diversity within isolated populations can occur quite rapidly in evolutionary terms, according to findings of a paper published in Proceedings of the Royal Society B (available online 29.1.14 http://dx.doi.org/10.1098/rspb.2013.3078). An isolated population of southern elephant seals which apparently thrived on the Victoria Land Coast in Antarctica for some seven thousand years, a relatively short period of time in evolutionary terms, was found to be an extremely genetically diverse group, more diverse in fact, than existing southern elephant seal populations. 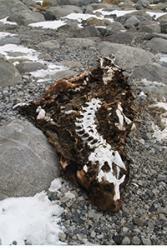 The extent to which population growth and sustained large population size can lead to rapid and significant increases in genetic diversity has not been widely studied, however, studying the mummified remains of 223 individual seals from the isolated community, provided an unique opportunity for this type of applied population genetics testing the underlying theory. The conclusion drawn from population genetic modelling, using Bayesian statistical methods, was that the diversity arose in situ within the population, rather than through introduction by incoming migration into the group from other populations. Mummified southern elephant seal remains from the Victoria Land Coast, Antarctica. : image credit Brenda HallIt seems that this particular breeding colony thrived between a point around 7,000 years ago: after the end of the last major Ice age and comparable to the beginning of the Bronze Age up until the mid 18th century. The retreating ice shelf and relative warmth along with favourable coastal habitat probably enabled the elephant seal population to grow rapidly and to a very large size. The findings suggest that some populations threatened by climate change or other factors, such as loss of habitat or isolation, may be able to respond better than predicted, if the environmental conditions are favourable.